Today only at Woot.com this Serta 20" or 25" Canopy Pet Bed is only $19.99 (Reg. $59.99)! 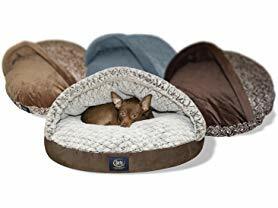 The Serta canopy nester pet bed is the perfect plush, comfortable retreat for pets who like to burrow. Ideal for dogs and cats! 25 inch: 25" x 25" x 8"
20 inch: 20" x 20" x 8"